Could a Single Vaccine Prevent Multiple Diseases Spread by Mosquitoes? Do Any Sports Supplements Actually Work? Since this holiday season America is caught in the midst of a cultural miasma, where people are confused about what is acceptable sexual harassment and what is not, along with the usual recurring concerns about commercialization, I am compiling some practical guidance. I want to wish you a Ron Swanson Christmas. 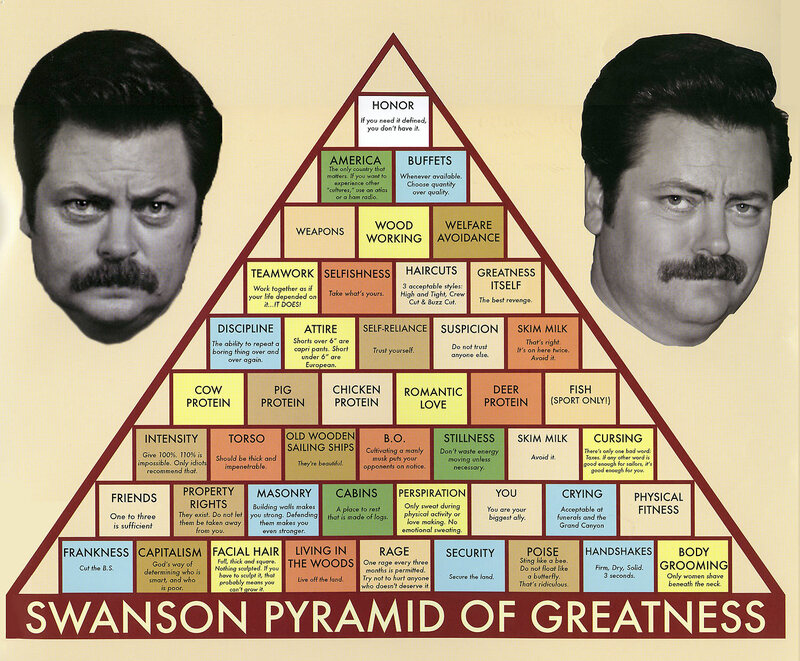 Swanson, a character on the television show "Parks and Recreation", is a staunch libertarian, which sounds counter-intuitive for someone in city government but that is why he is there; he wants to keep spending low and he knows if he is in a job someone who might want to make government bigger cannot be. In his role he makes sure government does nothing, so that it stays out of the way. And he delivers some common-sense science and health advice. So if you are dreading an upcoming holiday gathering where someone tells you about some new trend for 2018, like health gurus saying they are going to recommend replacing Internet breast milk with bovine milk - the Teat-To-Table Initiative - geared toward Manhattan elites at $80 a half gallon (1), or a discussion about how you will be paying $10 a minute for Internet access if we go back to 2015, Ron Swanson is here to help. All images copyright NBC Universal. "When I eat, it is the food that is scared." 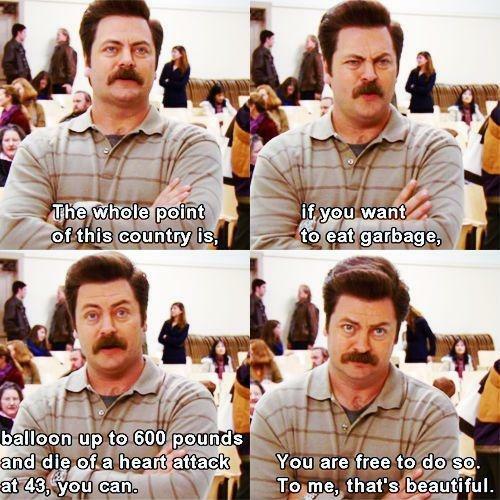 "The whole point of this country is if you want to eat garbage, balloon up to 600 pounds and die of a heart attack at 43, you can! You are free to do so. To me, that’s beautiful." "There must be a mistake. You've accidentally given me the food that my food eats." Season 5, episode 12. "I call this turf ‘n’ turf. It’s a 16 oz T-bone and a 24 oz porterhouse. Also, whiskey and a cigar. I am going to consume all of this at the same time because I am a free American." Okay, please ignore that last one. 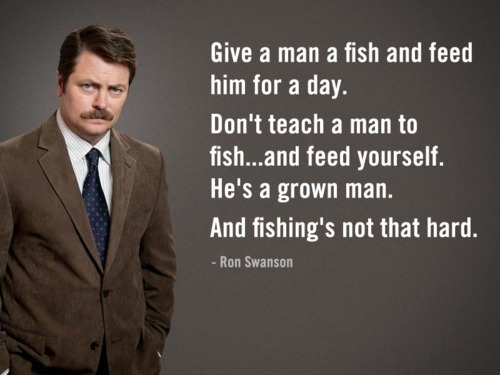 While fishing may not be that hard, educating the public about science and health is. 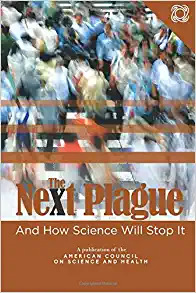 America is overrun with scaremongering about food, energy and medicine on one side and people touting miracle vegetables on the other. Corporate media are sure not going to help. So we do need your help to have a Merry Christmas, we are overwhelmingly supported by individual donations, no government funding, no fancy endowment. You can make a donation here. (1) Yes, that is regular milk, but Teat To Table sounds more expensive and therefore morally superior. 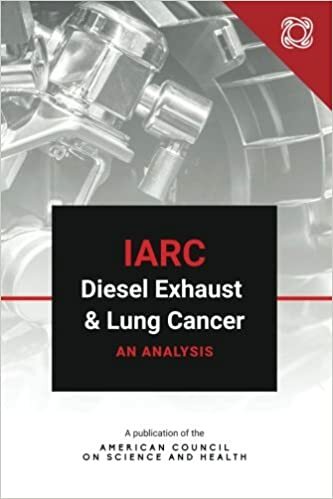 Hank Campbell is an award-winning science writer and bestselling author. He became the second President of the American Council on Science and Health in June of 2015 and prior to that began the 2006 Science 2.0 movement. He has written for USA Today, Wall Street Journal, Wired, and in many more places. He is on the Board of Trustees at Science 2.0 and serves on the Advisory Council of Atlantic Legal Foundation. 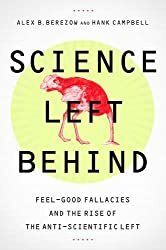 Forbes - “on many of the most critical issues of our time, the “progressive” perspective is often rooted in out-dated, anti-empirical, junk science paradigms that threaten innovation—and are beginning to unnerve the most scientifically minded thinkers on the left." Science Based Medicine - "pure music to the ears of science-based medicine. They agree that the anti-vaccine movement is based on outright lies, they call the Huffington Post a laughingstock of the scientific community for its endorsement of CAM, they call for the NCCAM to be abolished, [and] they explain why presenting data about relative risks rather than absolute risks is misleading."